It the middle section of the Seychelles archipelago is a small, private island that is achieving some of the best conservation work in the world. 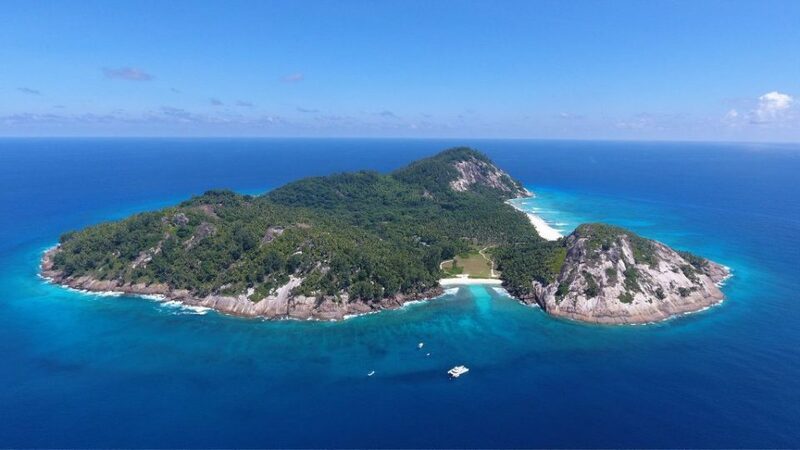 This claim to fame is backed up by National Geographic, who awarded the island as Best for Conserving the Natural World 2017, and has been achieved in large part due to ecotourists volunteering in the Seychelles. North Island is a pristine example of how small, but continual conservation measures can have a huge impact. They are fast becoming a model for tropical island restoration. The opportunity to volunteer in the Seychelles on a private island (at a significantly reduced cost) is extremely rare. Conservation of North Island is envisioned in the Noah’s Ark Project – a plan initiated in the last decade to restore the island to its former glory and give the indigenous flora and fauna a chance to repopulate and rejuvenate. This involves removing coconut palms, planting indigenous flora (which in turn, naturally attract indigenous bird species), monitoring the endangered Green and critically endangered Hawksbill Turtle populations, and monitoring the fish species that occur around the island. Much credit needs to be given to those who volunteer in the Seychelles and contribute their time. The Aldabra Giant Tortoise, which was nearly eradicated during the colonial era, has also been reintroduced, and their population now thrives. Nine hundred invasive Indian Myna birds were eradicated in a single year, with an estimated 9-12 left on the island today. Before conservation work here began, the island was ruled by rats, coconuts, and invasive birds. The apex predator of North Island today is the Seychelles Kestrel – one of 13 species and 17 subspecies of birds found only in the Seychelles. The bird species that now occur are hugely prized, including the Seychelles White-eye, the Blue Pigeon and Moor Hen, several of which are monitored daily. The ultimate goal is for the return of the Seychelles Magpie-Robin, as well as the Seychelles Paradise Flycatcher. Those who volunteer in the Seychelles conduct turtle patrols daily at sunrise – before anyone else plants a footprint in the sand. Hawksbill nesting season typically runs from October to March, and Green Turtle nesting from March to October, so there is turtle activity all-year-round. During these times, fresh turtle tracks can be found daily. There is also a very high chance of seeing some turtles emerge and lay their eggs! Ecotourists who volunteer in the Seychelles take all precautions not to cause the animals distress when turtles are tagged and when ensuring that discovered nests are as secure as possible – mostly by piling heaps of sand on top and packing it tightly and then marking the nests. Turtle eggs can endure huge amounts of pressure and this also protects them from being preyed on by crabs. The eggs can hatch within two months. However, the survival rate of turtles making it to adulthood is about 1 in 10 000… This highlights the importance of ensuring that as many eggs are protected as possible. The incubation period for Hawksbill Turtle nests is roughly 60 days, and roughly 55 days for Green Turtle nests. This means that the island typically has nests due to hatch at any time of the year, with the peaks in number of nests due to hatch in February/March (as a result of peak Hawksbill nesting being recorded in December/January, and in August/September (as a result of peak Green nesting being recorded in June/July). There is an amazing array of marine life in the warm Seychelles waters, including curious turtles, White-tipped Reef Sharks, Butterfly Fish, Angle Fish, Porcupine Fish, Eagle Rays, and many, many more. Whale Sharks are also often seen swimming close to the shore, which provides an opportunity for a Seychelles volunteer to get up close to the largest fish in the ocean! If you enjoy snorkelling, the fish identification work is a really enjoyable. You swim with an underwater camera and may get the chance to document a rare or even an unidentified fish species! A Seychelles volunteer with diving experience and a good knowledge of marine species, are greatly valued for this task. There are also ongoing studies of how climate change is affecting the coral reefs. There is a wealth of knowledge to learn. Ecotourists volunteering in the Seychelles get to spend plenty of time in the nursery helping plant seedlings and learning about the endemic plant species. Many are fruit-bearing, and have helped with the natural re-visitation of endemic bird species, such as the Blue Pigeon. It’s so amazing when species return to their natural habitats via their own volition. The Seychelles conservation team attempts to plant all seedlings during the summer months when there is good rain. The next task is to then start again with new seedlings, so there is much green finger work to be done by those who come to volunteer in the Seychelles! Over 1000 indigenous plants are given a permanent home every week. It takes about an hour to get to North Island via ferry, which provides a great opportunity to take it all in and feel the excitement of what you are about to experience build up. The ocean colour often turns to azure blue when you reach the island. The environmental couple wait on the beach to greet you when you arrive. The environmental managers, Tarryn and CJ have been on the island together for 3 years. The first bit of insight for ecotourists who volunteer in the Seychelles is seeing the Rat Room, where every incoming item is checked for stowaway rodents. Rats ruled the island for 200 years until they were successfully eradicated, which was North Island’s first significant conservation achievement. Transport around North Island is via foot, golf cart, or bicycle. A Seychelles volunteer also gets issued with a staff uniform, meaning that there is no need to pack a big suitcase. There are also many affordable and very hospitable Air BnB’s to stay in on Mahé before making your way to North Island, or before departing home, and the local transport is a great experience. Staff meals on North Island are served sort of buffet-style and in huge quantities. A Seychelles volunteer is issued with their own plate and cutlery, the kitchen staff piles on the food they choose, and you do your own washing up. During meal breaks you also get a chance to sit with the local staff and learn more about life on the island. There is also a local shop open 3 times a week, which sells various items including drinks and snacks. There are 155 islands that comprise the Seychelles but just two islands where the bulk of goods and tourists make landfall – Praslin and La Digue, both famous for their beauty and the legendary coco de mer. A Seychelles volunteer will have the opportunity to visit these islands during their stay, if you so wish. 90% of the Seychellois population is found on Mahé and the Seychelles as a whole has been influenced by Africa, Asia and Europe throughout its history. There is also evidence of pirates having used the islands in the 18th century. It is a very diverse country to visit. The Wildlife ACT work schedule for ecotourists who volunteer in the Seychelles is flexible, and you can choose which tasks appeal to you most and which days you want to take off. There is even the option of camping on the beach if you wish to increase your chances of seeing emerging turtles, but don’t expect to get much sleep! The excitement is just too great. There are also ongoing soil studies, and research into Aldabra Giant Tortoise behaviour. This involves tracking the movement patterns of individuals by taking GPS locations. The aim is to determine which areas certain individuals are frequenting and why. I can’t encourage you enough to visit North Island and help contribute towards something truly meaningful by volunteering in the Seychelles and helping with the island conservation efforts being done. It’s an experience you will never forget.